In 2014, the Belarusian authorities started preparations for a new demographic security program. The problems facing Belarus are not unique in Europe, but in many ways they look worse than in most EU countries. Belarus continues to face a trend of depopulation, and with a birth rate of 1.6, there appears to be no chance for it to sustain its current level, much less grow. Demographic pressures will force the government to raise the age of retirement, at least for women, from 55 to 60. In neighbouring Poland the authorities have already raised the retirement age up to 67 in attempt to deal with its own demographic issues. The healthcare and social security systems remain under a tremendous amount of pressure, as the number of people of working age in society is steadily declining. Mortality and fertility rates are not solely responsible for this trend, as emigration also affects Belarus' demographic situation. Many Belarusians say that the country "lacks the necessary hands to work." To improve the situation, the state should, on the one hand, liberalise the economy, and on the other increase benefits for child bearers. When working on a new program of demographic security, the authorities must rely on real statistics, as the official data does not reflect the reality. Last month Mariana Shchotkina, the Minister of Labour and Social Protection, announced the launch of their new programme entitled Demographic Security of Belarus. The current programme ends in 2015. Its results were, overall, considered to be unsatisfactory, although Belarus has improved its position according to several indicators. Since gaining its independence Belarus has lost about 750,000 people. According to official data, 2014 became the first year since 1994, when the nation's population saw an increase. However, this data is inadequate in assessing the nation's total population as Belarus' official statistics ignore the exact number of Belarusians who have emigrated. Both independent and pro-government analysts say that the Belarusian National Statistical Committee is not presenting an honest picture. For one, they have concluded that the migration balance for Belarus is negative, meaning more people are leaving than coming in. When considering the overall picture, it is clear that the official statistics are not accurately portraying the true demographic dynamics at play in Belarus. To ensure level of population replacement reaches an equilibrium, it is necessary for every woman to give birth to 2.15 children. At present, it is around 1.6 per woman in Belarus. Two-thirds of families have only one child. Belarus remains a country of broken marriages, as about half of all families split up and there is no reason to believe that this figure will change in the near future. As it was 20 years ago, women in Belarus make up more than half of the population. According to official statistics, in early 2014 Belarus has 4,401 thousand men and 5,067 thousand women. Many Belarusian villages, where a predominantly elderly population lives, have only one man to a much numerous population of women co-inhabitants. This is due to the well-documented fact that Belarusian men tend to die much younger than women. Male life expectancy in Belarus is about 67 years, while their female counterparts are living until they are approximately 77 years old. In neighbouring Poland these figures stands at 76 and 80 years respectively. According to the World Health Organisation, Belarusian males between 15-60 years of age are 3-4.5 more likely to die than males in the European Union. Many countries are struggling, and unsuccessfully so, with depopulation and ageing, but Belarus is unique in its own way. Despite the high mortality and low fertility rates, the authorities have not carried out any pension reform. 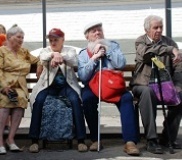 Belarusian women are permitted to retire at the age of 55 and men at 60. Many professions, such as the police, allow their employees to retire at 45. Further delays in pension reform will undoubtedly cost Belarus dearly in the future. Without serious reform, the healthcare system will come under attack. Promoting a healthy lifestyle still appears to be an unpopular policy in the country, as Belarusians remain among the heaviest drinking and smoking nations in the world. The number of diseases will continue to be high, while Belarusian medicine remains largely in the hands of the state, which has less and less money for these services. The general concept of family values also appears to be rather foreign to Belarusians. Local organisations hardly take the time to deal with this problem, and churches do not have the opportunity to become engaged in this work. Last year, the government banned a march in defence of family values, even though the Orthodox and Catholic churches supported it. The state promotes family values ​​only with its words, not with its actions. The Belarusian leadership is a case in point. In Belarus, nobody knows precisely where Lukashenka's wife lives, nor who gave birth to Lukashenka`s youngest. Is There any Chance to Rectify the Situation? It seems rather unlikely that Belarus will be able to reverse the current trend of demographic decline, a process that has been unfolding over the past 20 years. Many people choose not to have children or to have only one for financial reasons, and the Belarusian government has no money to provide a high level of well-distributed social benefits for its citizens. An average Belarusian teacher earns about $400 monthly, while a doctor brings in only $ 600. With these kinds of salaries, many Belarusians are simply afraid to have a two or three child family. According to a UN forecast, by 2025 the population of Belarus will drop down to 8.6 million people. The rate of economic growth will also continue to decrease. Without the necessary funds, carrying out reforms to deal with its demographic issues will be difficult, and waiting any longer will make them even more difficult to implement. These reforms must be pursued as soon as possible. The Belarusian government must start priming its policy based on real data, not on the current National Statistical Office`s information. The authorities have to liberalise the economy, which can help in an effort to have more people stay in Belarus and even convince some emigrants to return. The state will be forced, at one point, to implement pension reform in order to avoid a full collapse in its the social security system. Raising the retirement age for women to mirror that of men can be a good start. Dealing with the nation's low fertility rate remains one of the most difficult tasks at hand, as it is necessary to provide parents a large payout at the time of birth and for several years after a child is born. Also, the state must drastically revise its strategy in promoting family values. If the authorities accomplish these tasks, Belarus will have at least a shot at correcting the current demographic situation.